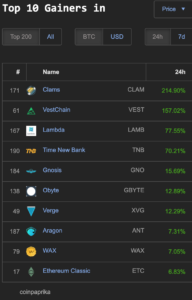 Bitcoin (BTC) is trading at 5300 about 200 USD higher than yesterday—and is still holding support on some of the faster EMAs (9) on the daily chart. 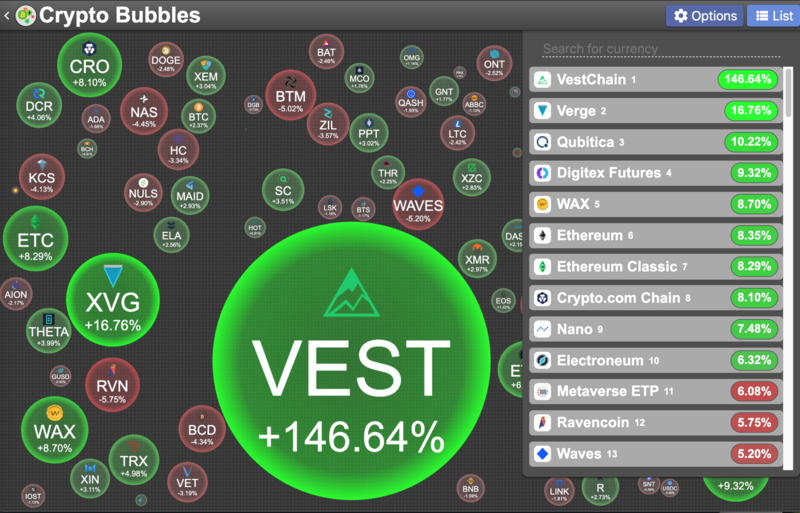 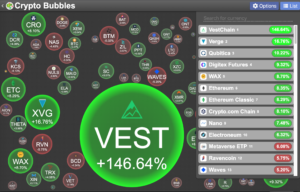 In the top 100 market cap cryptobubbles.net has 3 coins gaining double or triple digit percentages in the top 100 market cap in the last 24 hours: VestChain (VEST) 146%, Verge (XVG) 16% and Qubitica (QBIT) 10%. 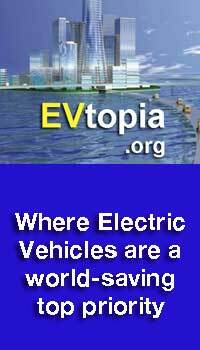 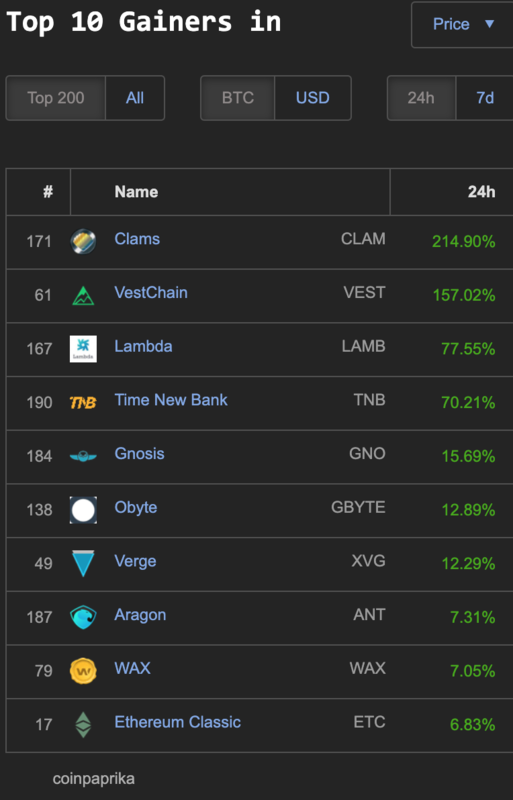 Leading within the 200 market cap on Coinpaprika.com: Clams (CLAM) 214%, VestChain (VEST) 157% followed by double digit gains by Lambda (LAMB) 77%, Time New Bank (TNB) 70%, Gnosis (GNO) 15%, Obyte (GBYTE) 12% and Verge (XVG) 12%. 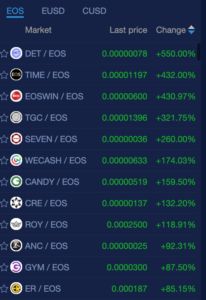 EOS projects trading on NewDex.io has 9 coins with over 100% gains today: DET (550%), TIME (432%), EOSWIN (430%), TGC (321%), SEVEN (260%), WECASH (174%), CANDY (159%), CRE (132%), and ROY (118%). 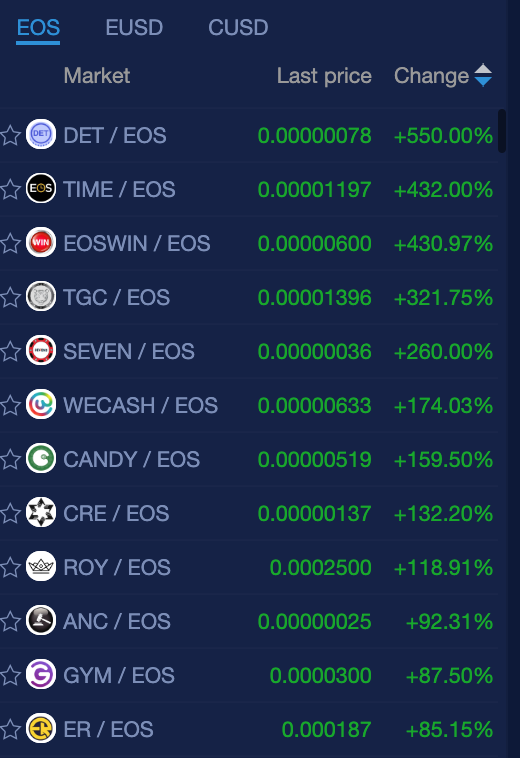 Also there are 24 EOS coins with double digit gains as well—some of those non gambling coins/tokens include: ANC (92%), GYM (87%), ZKS (62%), YDAPP (54%), LITE (43%), EMDS (28%), SEED (31%), PGL (27%), POOR (25%), ENB (16%), EOX (11%) and BLACK (10%).